Editor's note: This is an excerpt of Planet Money's newsletter. You can sign up here. 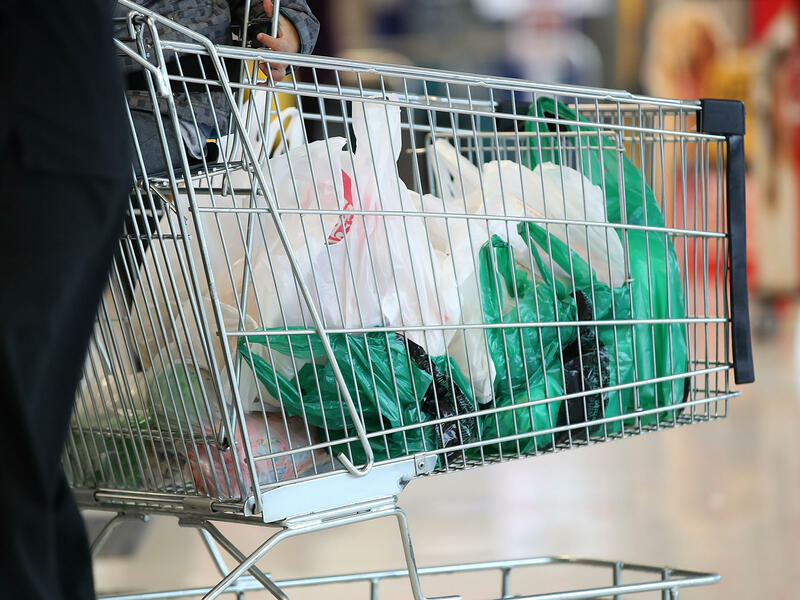 It was only about 40 years ago that plastic bags became standard at U.S. grocery stores. This also made them standard in sewers, landfills, rivers and the Great Pacific Garbage Patch. They clog drains and cause floods, litter landscapes and kill wildlife. The national movement to get rid of them is gaining steam — with more than 240 cities and counties passing laws that ban or tax them since 2007. New York recently became the second U.S. state to ban them. But these bans may be hurting the environment more than helping it. University of Sydney economist Rebecca Taylor started studying bag regulations because it seemed as though every time she moved for a new job — from Washington, D.C., to California to Australia — bag restrictions were implemented shortly after. "Yeah, these policies might be following me," she jokes. Taylor recently published a study of bag regulations in California. It's a classic tale of unintended consequences. Before California banned plastic shopping bags statewide in late 2016, a wave of 139 California cities and counties implemented the policy themselves. Taylor and colleagues compared bag use in cities with bans with those without them. For six months, they spent weekends in grocery stores tallying the types of bags people carried out (she admits these weren't her wildest weekends). She also analyzed these stores' sales data. Taylor found these bag bans did what they were supposed to: People in the cities with the bans used fewer plastic bags, which led to about 40 million fewer pounds of plastic trash per year. But people who used to reuse their shopping bags for other purposes, like picking up dog poop or lining trash bins, still needed bags. "What I found was that sales of garbage bags actually skyrocketed after plastic grocery bags were banned," she says. This was particularly the case for small, 4-gallon bags, which saw a 120 percent increase in sales after bans went into effect. Trash bags are thick and use more plastic than typical shopping bags. "So about 30 percent of the plastic that was eliminated by the ban comes back in the form of thicker garbage bags," Taylor says. On top of that, cities that banned plastic bags saw a surge in the use of paper bags, which she estimates resulted in about 80 million pounds of extra paper trash per year. Plastic haters, it's time to brace yourselves. A bunch of studies find that paper bags are actually worse for the environment. They require cutting down and processing trees, which involves lots of water, toxic chemicals, fuel and heavy machinery. While paper is biodegradable and avoids some of the problems of plastic, Taylor says, the huge increase of paper, together with the uptick in plastic trash bags, means banning plastic shopping bags increases greenhouse gas emissions. That said, these bans do reduce nonbiodegradable litter. Are tote bags killing us? What about reusable cloth bags? We know die-hard public radio fans love them! They've got to be great, right? Nope. They can be even worse. A 2011 study by the U.K. government found a person would have to reuse a cotton tote bag 131 times before it was better for climate change than using a plastic grocery bag once. The Danish government recently did a study that took into account environmental impacts beyond simply greenhouse gas emissions, including water use, damage to ecosystems and air pollution. These factors make cloth bags even worse. They estimate you would have to use an organic cotton bag 20,000 times more than a plastic grocery bag to make using it better for the environment. That said, the Danish government's estimate doesn't take into account the effects of bags littering land and sea, where plastic is clearly the worst offender. Stop depressing me. What should we do? The most environment-friendly way to carry groceries is to use the same bag over and over again. According to the Danish study, the best reusable ones are made from polyester or plastics like polypropylene. Those still have to be used dozens and dozens of times to be greener than plastic grocery bags, which have the smallest carbon footprint for a single use. As for bag policies, Taylor says a fee is smarter than a ban. She has a second paper showing a small fee for bags is just as effective as a ban when it comes to encouraging use of reusable bags. But a fee offers flexibility for people who reuse plastic bags for garbage disposal or dog walking. Taylor believes the recent legislation passed in New York is a bad version of the policy. It bans only plastic bags and gives free rein to using paper ones (counties have the option to impose a 5-cent fee on them). Taylor is concerned this will drive up paper use. The best policy, Taylor says, imposes a fee on both paper and plastic bags and encourages reuse. This bag research makes public radio's love for tote bags awkward, doesn't it? It might be weird, though, if we started giving out plastic grocery bags.